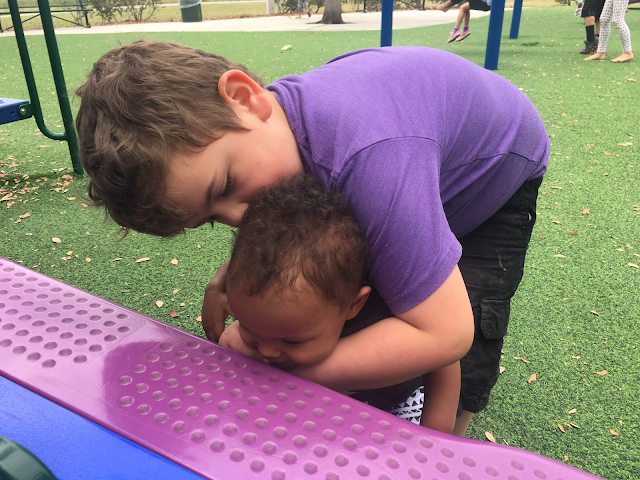 The first day my husband went back to work and left me at home with two kids -- a four and a half year old and a preemie newborn -- we went to the park. It was abnormally cold outside. We were all bundled up. I wrapped the newborn up close to my chest and hoped she wouldn't freeze. It was Florida, after all, and we shouldn't be having these thoughts -- why did it have to be so cold?! My four and a half year old skipped ahead of us, bundled in a jacket and slinging a stale loaf of bread around in hopes we would see ducks. It was too cold for the ducks, but we trudged on around a lake as the chilly wind whipped us in the face. "There are no ducks," he whined. The baby cried. I wondered if she was freezing. For about thirty seconds, I resented my husband for going back to work and secretly cursed everyone in our lives who trusted me alone with two kids and no back up. We got back into the car, and my four and a half year old asked to go get a bagel. "My sister is boring," he said, staring at the tiny infant who had instantly fallen asleep once the car began moving. "She won't always be," I said. It only took us a couple of weeks to find our footing. Being alone with the two kids felt as natural to me as breathing, and watching them together quickly became my greatest joy. As quickly as we found our footing, it's coming loose again as things will when change begins to happen. Ethan is almost six and wrapping up his year of preschool faster than I would like, and Carmen and I are trying to find our own routine and new normal in the hours which he is gone. It feels like practice for the fall when Kindergarten will swoop him up and force us to create a schedule that doesn't include getting him at noon. I'm not sure who will feel the impact of that loss of togetherness the most, myself or her. In the meantime, a stomach bug has kept us all home together. No preschool and no extracurriculars and no plans. Just us together, puke buckets lined with plastic Publix bags and beach towels draped across the tile. "My sister drives me up a wall," Ethan says. "She's so crazy but she's my best friend." I hope she will always be, I think and I remember that unusually chilly March morning last year when a new layer of life was freshly exposed. I hope so much she will always be. 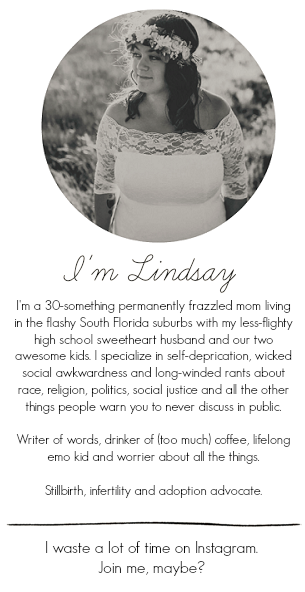 Wow so nice post "Lindsay". Thanks for sharing with us.